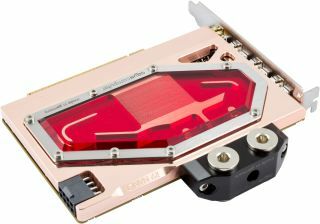 The AMD Radeon R9 Fury Nano is out now, and Aqua Computer has announced the first water cooling solution for it, due to be available for order this week. According to Tom’s Hardware, the Kryographics R9 Nano block will be a single slot solution made of pure electrolytic copper. The full cover block has active cooling for the VRMs which make contact through thermal pads, while the GPU and HMB memory use thermal paste. Aqua Computer says that even running under extreme load, the GPU temperature remains below 35 degrees. Two different versions of the block will be available, one with a plexiglass cover where you can see the fluid passing through, and another with a simple, closed brushed aluminum cover. For single-slot configurations, Aqua Computer will be offering a replacement I/O bracket. The Kryographics for Radeon R9 Nano water cooling solution is available from Aqua Computer’s website for €90. According to our verdict, the R9 Nano is already a hell of a little graphics card. There are no official measurements available for the cooler, but it should make the diminutive R9 Nano even smaller. All the Nano configurations so far are two-slot cards, so the single-slot water block could help the Nano squeeze into even tighter mini-ITX quarters. And it'll be cooler, since the fan-equipped Nano maxed out at 75C.